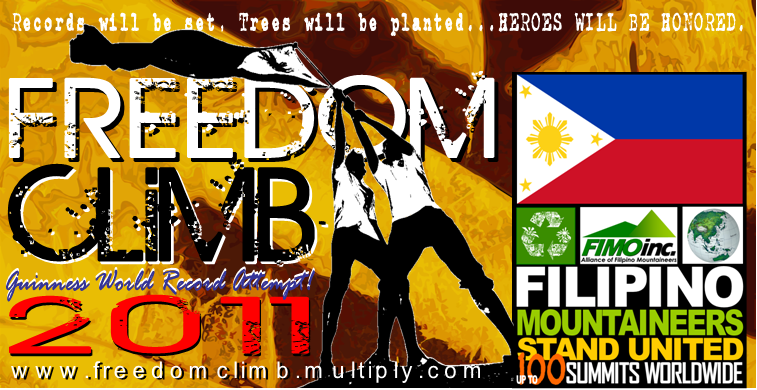 Join the FREEDOM CLIMB 2011, registration extended! Join this year's "FREEDOM CLIMB" on June 12, 2011 and take part in the country's Guinness world record attempt for the LARGEST NUMBER OF PEOPLE SUMMITING MOUNTAINS in 24 HOURS in multiple locations. In South Cotabato there will be two event locations for FREEDOM CLIMB 2011- Mt. Matutum in Tupi, South Cotabato which is 2, 286 meters high above sea level and Mt. Parker in T'boli, South Cotabato which is 1,145 meters high above sea level. Registration is extended until May 21, 2011! Only those who registered will be counted for the world record attempt and will be given certificate of achievement. There will be also a limit of participants for every climbing destinations, this is to sustain and protect the environment. Participants will be also asked to plant trees on the way up and will be doing clean-up drive on the way down. For registration and further details please contact the regional coordinator for Southern Mindanao Engr. Albert Gabriel at his mobile nos. 09193142117 or email- adventuregabo@yahoo.com, you may also inquire at the local government units of Tupi and T'boli, South Cotabato.